Every substance has unique properties. For example, the properties listed in Table 1.3 allow us to distinguish hydrogen, oxygen, and water from one another. The properties of matter can be categorized as physical or chemical. Physical properties can be observed without changing the identity and composition of the substance. These properties include color, odor, density, melting point, boiling point, and hardness. Chemical properties describe the way a substance may change, or react, to form other substances. A common chemical property is flammability, the ability of a substance to burn in the presence of oxygen. Some properties, such as temperature and melting point, are intensive properties. They do not depend on the amount of sample being examined and are particularly useful in chemistry because many intensive properties can be used to identify substances. Extensive properties depend on the amount of sample, with two examples being mass and volume. Extensive properties relate to the amount of substance present. The changes substances undergo are either physical or chemical. During a physical change, a substance changes its physical appearance but not its composition. (That is, it is the same substance before and after the change.) The evaporation of water is a physical change. When water evaporates, it changes from the liquid state to the gas state, but it is still composed of water molecules, as depicted in Figure 1.4. All changes of state (for example, from liquid to gas or from liquid to solid) are physical changes. In a chemical change (also called a chemical reaction), a substance is transformed into a chemically different substance. 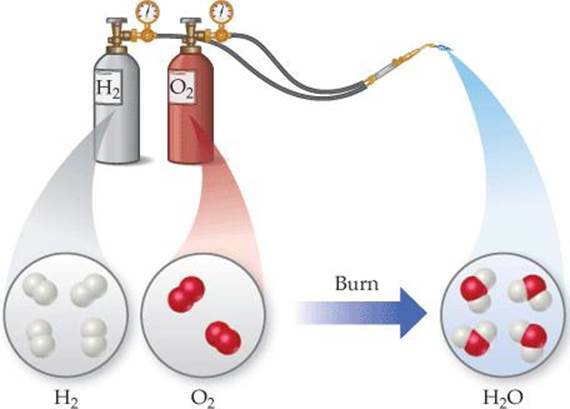 When hydrogen burns in air, for example, it undergoes a chemical change because it combines with oxygen to form water ( FIGURE 1.10). FIGURE 1.10 A chemical reaction. Chemical changes can be dramatic. In the account that follows, Ira Remsen, author of a popular chemistry text published in 1901, describes his first experiences with chemical reactions. The chemical reaction that he observed is shown in FIGURE 1.11. FIGURE 1.11 The chemical reaction between a copper penny and nitric acid. The dissolved copper produces the blue-green solution; the reddish brown gas produced is nitrogen dioxide. While reading a textbook of chemistry, I came upon the statement “nitric acid acts upon copper,” and I determined to see what this meant. Having located some nitric acid, I had only to learn what the words “act upon” meant. In the interest of knowledge I was even willing to sacrifice one of the few copper cents then in my possession. I put one of them on the table, opened a bottle labeled “nitric acid,” poured some of the liquid on the copper, and prepared to make an observation. But what was this wonderful thing which I beheld? The cent was already changed, and it was no small change either. A greenish-blue liquid foamed and fumed over the cent and over the table. The air became colored dark red. How could I stop this? I tried by picking the cent up and throwing it out the window. I learned another fact: nitric acid acts upon fingers. The pain led to another unpremeditated experiment. I drew my fingers across my trousers and discovered nitric acid acts upon trousers. That was the most impressive experiment I have ever performed. I tell of it even now with interest. It was a revelation to me. Plainly the only way to learn about such remarkable kinds of action is to see the results, to experiment, to work in the laboratory. Which of these changes are physical and which are chemical? Explain. a. Plants make sugar from carbon dioxide and water. b. Water vapor in the air forms frost. c. A goldsmith melts a nugget of gold and pulls it into a wire. We can separate a mixture into its components by taking advantage of differences in their properties. For example, a heterogeneous mixture of iron filings and gold filings could be sorted by color into iron and gold. A less tedious approach would be to use a magnet to attract the iron filings, leaving the gold ones behind. We can also take advantage of an important chemical difference between these two metals: Many acids dissolve iron but not gold. Thus, if we put our mixture into an appropriate acid, the acid would dissolve the iron and the solid gold would be left behind. The two could then be separated by filtration ( FIGURE 1.12). We would have to use other chemical reactions, which we will learn about later, to transform the dissolved iron back into metal. An important method of separating the components of a homogeneous mixture is distillation, a process that depends on the different abilities of substances to form gases. FIGURE 1.12 Separation by filtration. A mixture of a solid and a liquid is poured through filter paper. The liquid passes through the paper while the solid remains on the paper. For example, if we boil a solution of salt and water, the water evaporates, forming a gas, and the salt is left behind. The gaseous water can be converted back to a liquid on the walls of a condenser, as shown in FIGURE 1.13. FIGURE 1.13 Distillation. 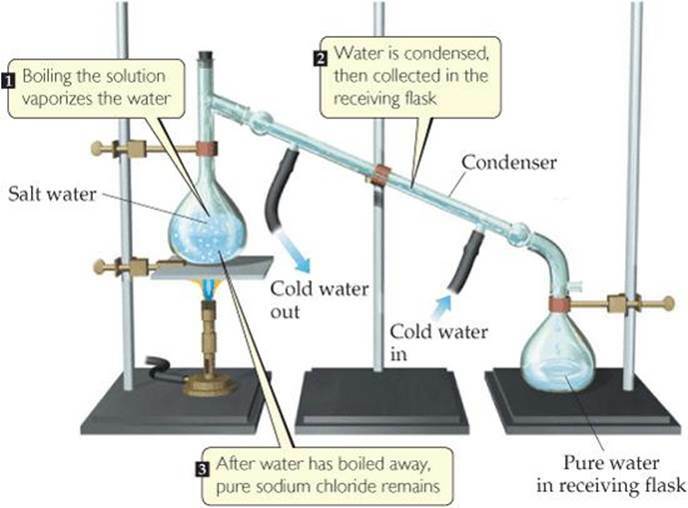 Apparatus for separating a sodium chloride solution (salt water) into its components. 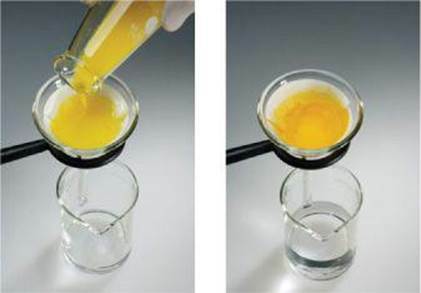 The differing abilities of substances to adhere to the surfaces of solids can also be used to separate mixtures. This ability is the basis of chromatography (literally, “the writing of colors”), a technique shown in FIGURE 1.14. FIGURE 1.14 Separation of ink into components by paper chromatography.